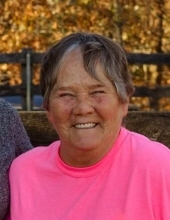 Margie Jane Wilkinson, 67, of Fulton went to live with the angels suddenly on Saturday, February 2, 2019. Margie was born on December 25, 1951 in Callaway County, the daughter of Sherman S. and Lulu O. (Comingore) Wilkinson. Margie attended Herring and South Callaway Schools. She worked many jobs in her life-time and was a union laborer. Most recently, she worked at Bridgeway. She is survived by her daughter Angelia Milliot of O’Fallon; granddaughters, Rachel Ramos (Anderson) of O’Fallon, and Nicole Musgrave of Chamois; grandson, Joshua Milliot of O’Fallon; great-grandsons, Wyatt Jones and Elias Ramos; sisters, Alice Capps of Columbia, and Minnie Humphrey of Fulton; brother, Harry Wilkinson of Blue Springs; and many nieces and nephews, and great nieces and nephews, with special mention of nieces Dottie Allen and Fay Grube that have spent a lot of time with her recently. Margie was preceded in death by her parents; daughter, Melissa Hall; brothers, Kenneth, Sherman, and Wesley Wilkinson, and Robert L, Charles, John J., and Julian Allen; sisters, Vivian Consegan, Jenness Griffin, and Rose Wiseman. Private family services are planned for February 17 for family and friends. Please contact Angelia Milliot or Minnie Humphrey for details. To send flowers or a remembrance gift to the family of Margie Jane Wilkinson, please visit our Tribute Store. "Email Address" would like to share the life celebration of Margie Jane Wilkinson. Click on the "link" to go to share a favorite memory or leave a condolence message for the family.